A couple weeks ago, I was asked to speak to my church about volunteering at Cass Community Social Services (CCSS). Inspired by my experiences at CCSS and my experiences with storytelling, I decided to not just give a speech, but to tell a story. Here's my story I told about why CCSS means so much to me personally (and it's why I pushed so hard to have CCSS be the charity we donate part of our ticket proceeds to from Listen to Your Mother this year). A few years ago, I fell in love with Cass Community Social Services and all the work they do in Detroit; I fell in love with the people that work there and the people that live there. My first trip to Cass Community Social Services was with a group from St. Paul's. We went down and painted apartments and planted gardens. We got a tour of the Green Industries where they make mud mats from old tires. We ate lunch with Cass clients. We really got to know the place and each other. We met the director of Cass, Reverand Faith Fowler and learned so much about Cass. We learned that they prepare and serve one million meals annually, that over 300 homeless men, women and children stay in one of their shelters, transitional housing or permanent housing programs. We learned how the Green Industries program employs over 70 adults and is designed to marry jobs with sustainability. My daughter Lucy, who was 9 at the time, was even impressed. I asked her what she thought about all of it and one of the things she said stuck with me, she said, "you know everyone has a back story." It wasn't getting to paint with the grown ups or watching people put together the mats that stuck with her, it was the stories of some of the residents. Since that visit, I have been back to Cass several times. And I've had the opportunity to have a one-on-one conversation with Reverend Fowler. She talked about the book she has written called This Far by Faith: Twenty Years at Cass Community, it is quite wonderful and insightful. She told me, she wrote it because people remember stories. She said she could tell people facts and numbers about Cass and statistics about Detroit and homelessness and lack of jobs, but it's the stories that stick with people and impact them. So today, I want to tell you a little bit about my backstory and part of the reason why going to Cass means so much to me and why I want to encourage people to give their time and money to Cass. And maybe make people think a little bit differently. You see, every time I go to Cass and meet one of the residents with a backstory that involves mental illness and/or addiction that led to homelessness, I think about my mother. I think that resident could be my mother. For over half my life, my mother has suffered from both mental illness and drug and alcohol addiction. She has pushed everyone away, refused help and even moved away. It is incredibly heartbreaking to try to help someone you love and they don't want it or can't accept it. It is especially hard when it is your parent because as many of you know...no matter how old we get, we need or we want our mothers. I fear that my mother will end up homeless and looking for someone to help her. And I can only hope that the community she lives in has a place like Cass with volunteers and programs to help her. I know first hand that life can be cruel and addiction can ruin people's lives. I watched a good mother suffer through years of an undiagnosed mental illness. I watched her change because of all of her self-medication and bad choices and fear and anger and paranoia. I watched. I begged with her to stop. I hired people to help. I yelled at doctors who were over-prescribing. I worked with people from social services. But sadly, soon we might be out of options. I tell you this because I know some of us might make judgements about homeless people or people with addiction issues and wonder why their families aren’t doing anything or helping. I want to tell you another side, the side of the story where the family is desperate to help and do something but nothing works. I tell you this to show you it’s not just a city problem, people in safe upper middle class suburbs can end up alone and suffering and yes, homeless. I tell you this because every time I go to Cass I think about my mother. And I think about the stories of of the people at Cass and their backstories and their families. And I think that if I can't save or help my mother, maybe I can help someone else's. So, yeah, I love Cass Community Social Services and I am so grateful to be a member of a church that supports them. I encourage, no I urge all of you to open your mind, open your heart and get involved with Cass Community Social Services. Go hear their stories and make them a part of yours. Several people came up to me after the church service and told me about their own family members who struggle with addiction or mental illness. There were hugs, hand squeezes of solidarity and even a few tears. I felt lifted up by their connection and hopefully they felt the same. There is power in sharing our stories. There is power in vulnerabilty. There is comfort in knowing we are not alone. 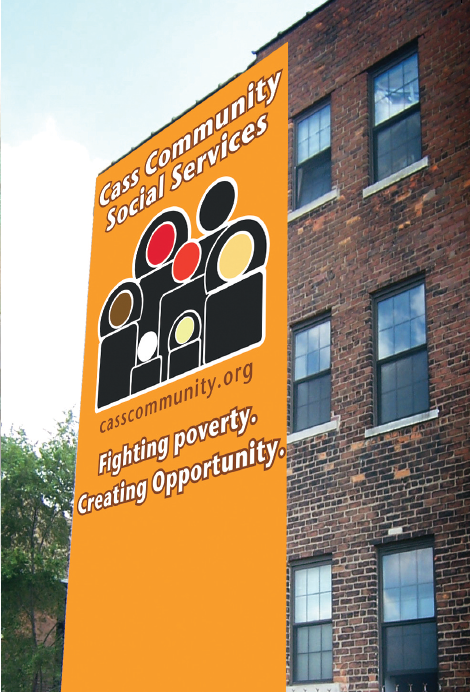 Click here to find out more about Cass Community Social Services. Click here to buy Reverend Fowler's book. Click here to find out more about Listen To Your Mother and here to buy tickets to hear stories and support Cass Community Social Services. Here's a video from when a few members of this year's LTYM cast and a couple of my kids went to volunteer at Cass.